When an auto enthusiast first looks at their car, they see it as a blank canvas with endless opportunities. When Chris Reed first glanced upon his new 2015 Mustang GT, he envisioned a masterpiece and already had a mental mod list. It’s always good to strategize and figure out what theme you want your car to have. For Chris, he wanted to add lime accents and other upgrades to have it stand apart from the rest. To do this, he installed a Roush Quad Valance, dipped calipers, hood struts, interior lights, wheel decals, and emblems. To change up the rear of his GT, Chris installed an MMD V-Series spoiler in factory black to match his car. Chris didn’t have to drill extra holes for the installation thankfully. All he had to do was use the included hardware and 3M bonding tape. Made from lightweight ABS plastic, this spoiler is durable and impact-resistant. We all know how hard it can be to see out of these muscle cars, so Chris was satisfied with this particular design which provides maximum rear visibility. Its notched out center accentuates the sculpted lines of the rear bumper and gives the rear end of his S550 an intimidating look. Chris moved on to the front end of his GT and installed an RTR upper grille complete with LED accent vent lights. 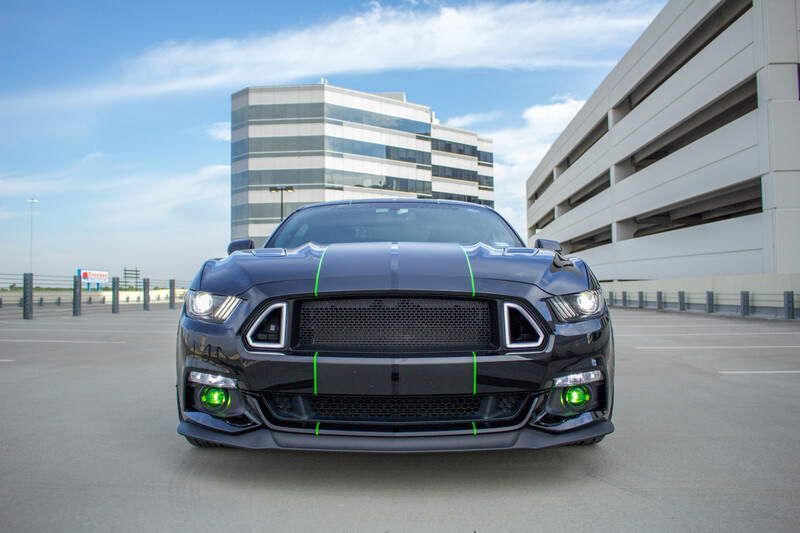 The very same grille featured OE on the Ready to Rock Mustang, designed and developed by Vaughn Gittin Jr. It offers the GT a modern, aggressive, race-inspired face to scare off the competition. Apart from aesthetics, this grille increases air flow to the radiator for improved cooling. Designed using original CAD data from Ford, the RTR upper grille features high pressure, injection molded thermal plastic to withstand the hazards of a tedious daily commute. Not only that, but the integrated LED vents provide a bright white and seriously unique lighting accent that’s sure to get Chris noticed. Perfect for daily driving and great for spur of the moment trips to the track, Chris dropped his GT just over an inch up front and one inch in the rear with a set of Steeda Sport lowering springs. Lowering his center of gravity for improved handling and less body roll, these blue powdercoated progressive rate springs offer a comfortable ride with a much more appealing stance. Eliminating the ugly factory wheel gap, these springs helped capture Chris’s vision all while making his GT feel more planted. Chris knew his car needed to not only look aggressive, but sound it as well. It’s not hard to understand why he chose the Corsa Xtreme cat-back exhaust with black quad tips. It offers a deep growling sound without any annoying drone while cruising thanks to straight-through Xtreme mufflers with Corsa’s patented Reflective Sound Cancellation® Technology (RSC™). Acoustically engineered and tuned, this system allows other to hear long before they see his GT. As an added bonus, the Xtreme cat-back improves his GT’s exhaust flow by 43% for an increase in horsepower and torque. The double helix X-pipe helps move power along and gives his Mustang that race car growl it deserves. Made of 304 stainless steel, this system features 3” mandrel-bent tubing with 2.5” step-down flanges and offers outstanding corrosion resistance. The high flow mufflers are finished off with a pair of twin 4” Pro-Series tips in black chrome, pairing well with Chris’s color scheme.